RMB - click on a quest name to set it as focused. LMB - click on the NPC name to switch to the Conversation History page. - API version changed to 100023. - Fixed wrong offset in click-map at completed quests index page. - Did some optimisations so the addon uses less memory and creates less garbage for garbage collector. - Fixed UI Error caused by pressing "Share" or "Abandon". - Added an option to display only zone names and categories at completed quests index page. Then you can click choosen category or zone name to view all completed quests in that category/zone. - Fixed a bug causing ui exceptions sometimes when finishing a quest. - Fixed a bug causing ui exceptions in non-english game version. - Fixed a bug causing display of empty quests list and sometimes even ui exceptions. - New version of LibHarvensAddonSettings (thanks to Garkin). 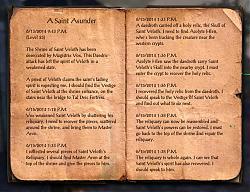 - Marking current quest as completed when there is no such quest in the vanilla quest journal. - Added experience points and veteran points reward for completing quest. - Made some fixes related to API changes. - Added an option to open the journal at currently focused quest. - Updated Addon Settings library. 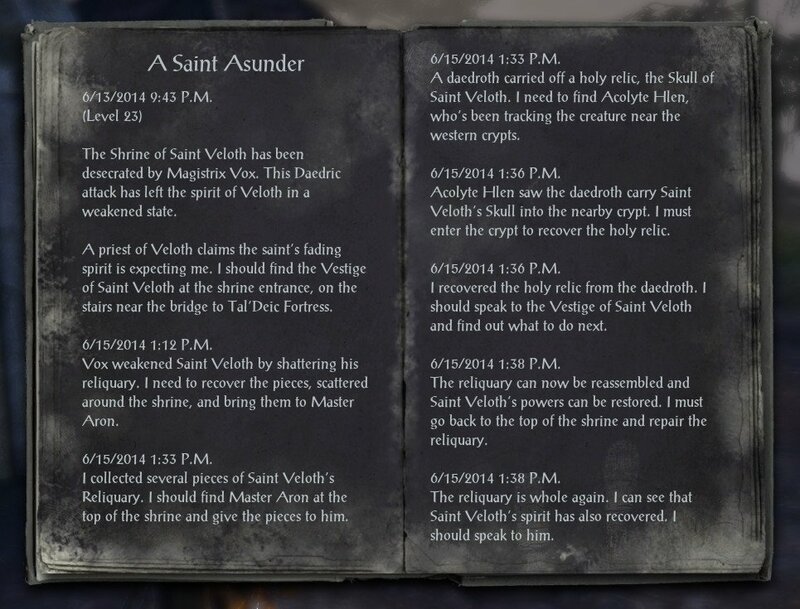 - Fixed a bug causing impossibility to click more than 8 quest names on the index page. It turns out that label control can have 8 links only so I've changed the click handlers - should work now. - Fixed lua exception which sometimes appeared after clicking NPC name on quest details page. 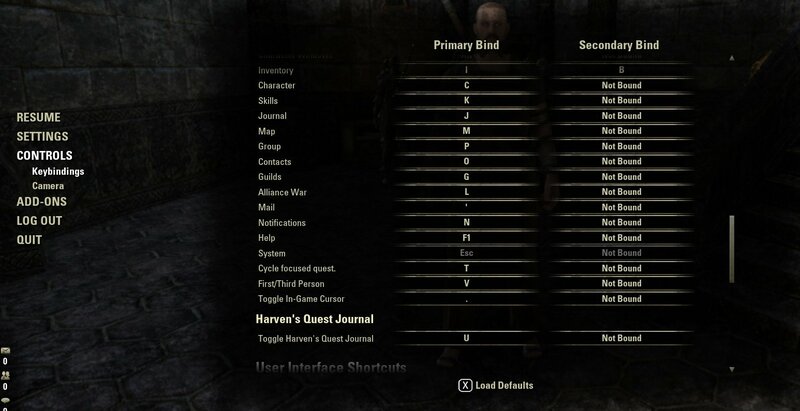 Hi, I'm not sure if this feature already exists (maybe I'm just blind xD), but I couldn't find a way to change key bindings for the journal. For me, the default key bound for "Set Focus" is already in use for something else (my quickslots are F1-F5). If you could implement a way for us to bind these functions to another key, I'd really appreciate it! 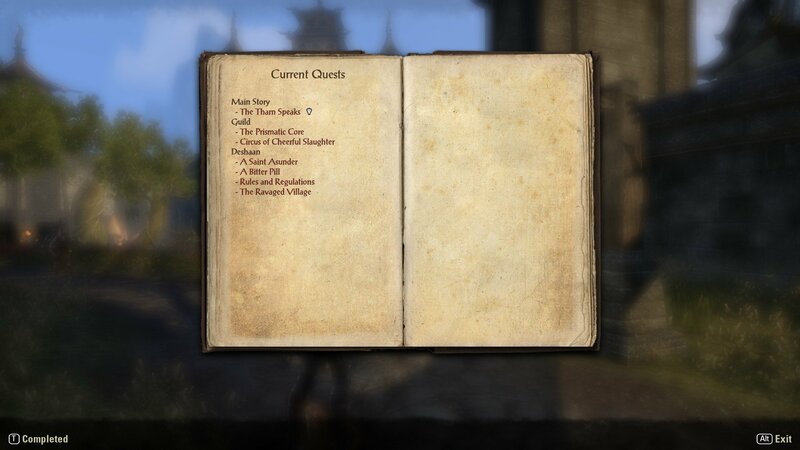 Also, I'd like to suggest the ability to right click when on the Quest Details page to go back to the Current/Completed Journal page (whichever you were on previously). I know the binding T functions as this, but this feels more natural - would rather have this replace T altogether. Lastly (I know, a lot of suggestions lol), if you could figure out a way to add the Almanac, Lore Library, Achievs, and Leaderboards in the upper right corner - similar to the default Journal - that would be awesome! As it is now, I still have to use the default journal if I want to check these as there is no keybind for them. Last edited by Alexandriae : 03/08/19 at 08:01 PM. Hi Harven. Thanks a lot to keep this wonderful addon alive. Last edited by lexo1000 : 03/07/19 at 06:47 PM. 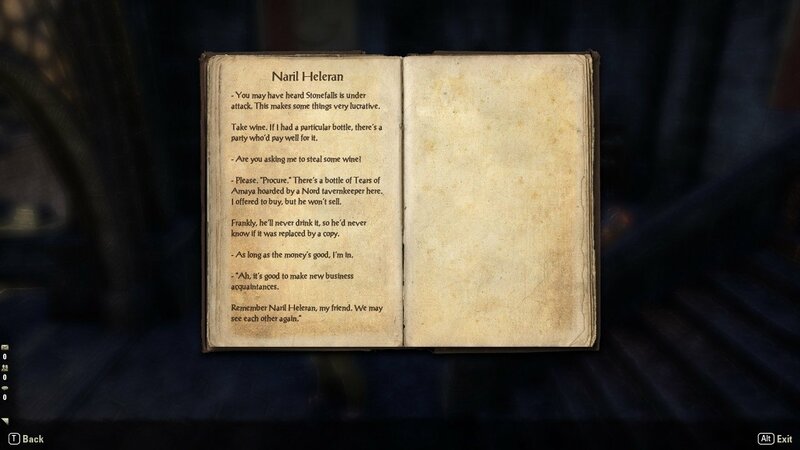 Thank you for this wonderful quests-book ! Oh nice, I was JUST about to post some screen shots of the issue and ask what was going on. 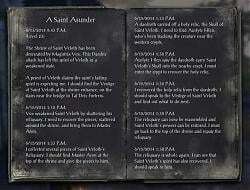 Thank you for keeping this mod going because it is way better then the vanilla quest log!! THANK YOU! I love this mod and can't live without it! If you have a suggestion, you would like to report a bug or just want to chat/ask some questions feel free to join our discord server https://discord.gg/QEWdHre. That is, HQJ does not create or maintain an independent record of each player-character's current quests and the quests which the character completes. 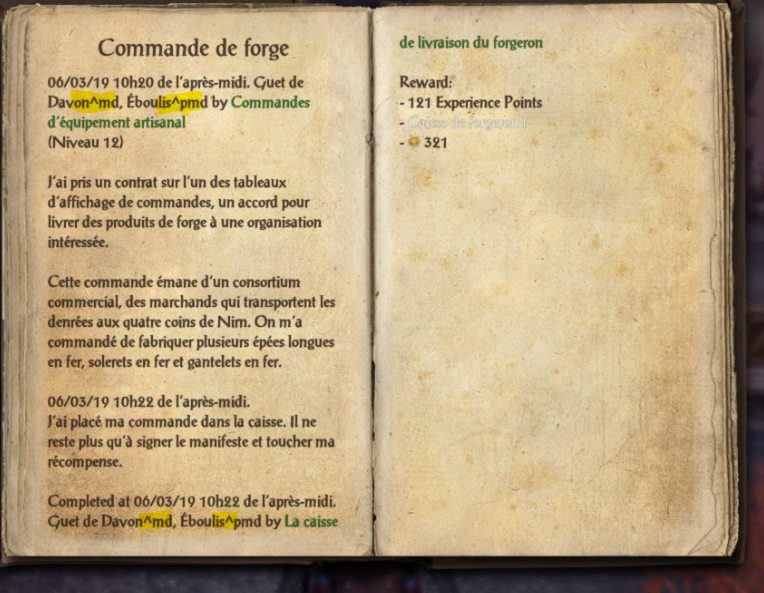 I do not know of any other ESO add-on which does maintain an independent Quest Journal archive and/or records of Achievements. That is unfortunate, and not what I have previously expected HQJ to do. 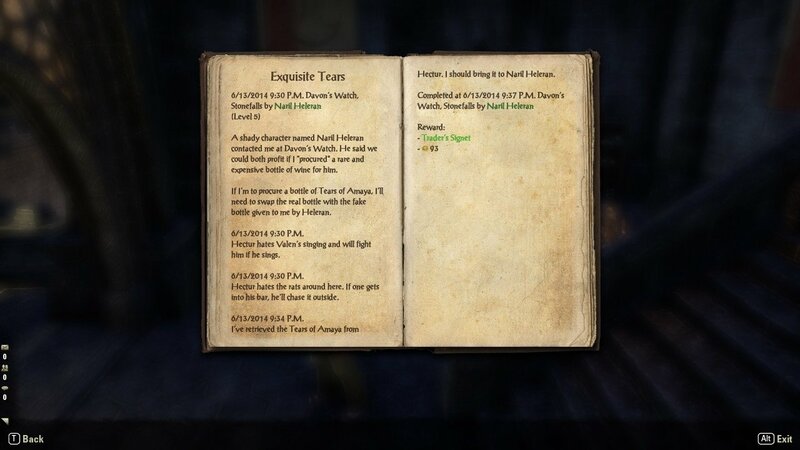 It is unfortunate because the NA megaserver records have become corrupted for the Quests which my character Ace Adeya has completed, along with specific achievements associated with them. Primarily, I can prove that corruption has occurred because Outfit Station Dyes were unlocked by completing specific quests, or for specific achievements such as "Hero of the Aldmeri Dominion". I don't know whether that will suffice to enable or to motivate ZOS to investigate and to rectify the corruption, thus to ameliorate its consequences. Last edited by Shadowshire : 02/22/19 at 01:11 AM. For this is the main reason to use an addon like this. Most of my characters already have done some quests. I need to know what quests they have already done. Otherwise the Completed quests section is useless unless you make a new character. That is a fair point. I like this addon & will continue to use it on new characters, but it would sure be great to have that ability. Harven: Do you plan on looking into a fix for the nil value error? Thanks very much! Last edited by RavenMind : 01/28/19 at 04:20 AM. I had the same error as the previous poster. Had to remove an empty entry for 'Wayrest Sewers I' from my saved variables in order to use the journal on that character again. I really dont know the reason and the help would be appreaciated. Thx in advance. P.S. As i said it works normaly on other characters just not on this one suddenly. Strange i know. 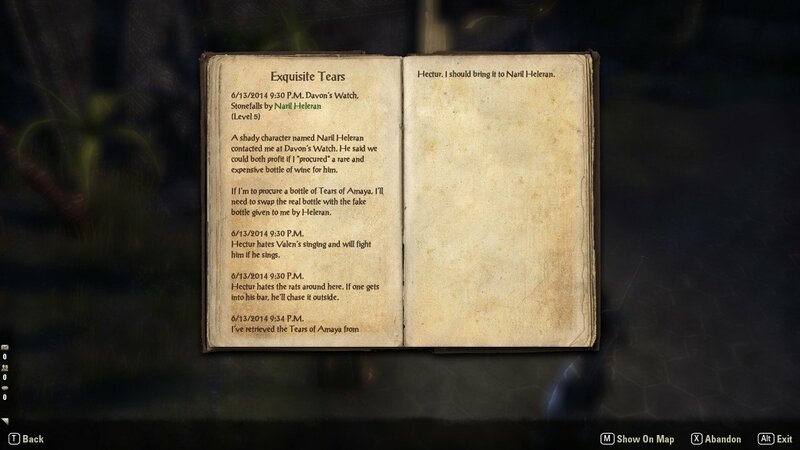 @Khedrak, you can only get titles of completed quests with ESO api. That's too little info for this addon so it will only log quests completed after you installed it. OK NVM I found an addon that does. I don't see why yours can not for it would make it better. Last edited by Khedrak : 06/07/18 at 09:48 AM. Last edited by Teva : 06/01/18 at 06:39 PM. I've not had a chance to try the changes you posted as yet, sorry.